The beginning of the Vampire Nation Chronicles, Book One, Legions of the Dark can be read as a standalone tale. 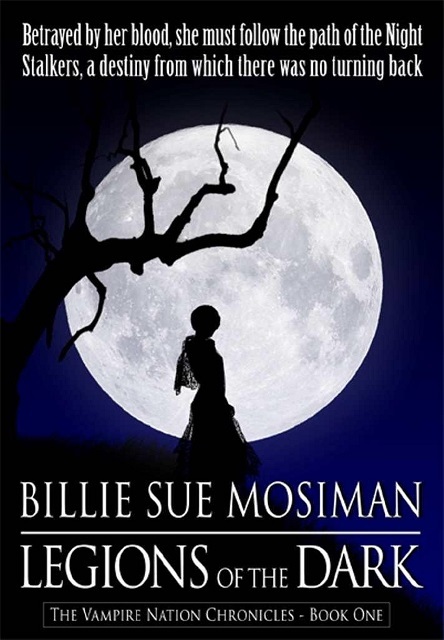 A Vampire novel by Bram Stoker Nominated Billie Sue Mosiman, author of more than 50 books. "This book is very fast paced and has an engrossing storyline. It's well written, entertaining, and hard to put down once you get started. " Jon Weber, Amazon review (for RED MOON RISING, the paperback title for LEGIONS OF THE DARK..
Della Cambian was a senior in high school when she was struck by the family curse; vampirism. With the aid of the ancient known as Mentor, and harried by an aging millionaire with dreams of immortality, Del must find a way to prevent an evil that could endanger every natural vampire on Earth. And what kind of vampire should she be? Does she have the innate violence to be a Predator? Does the future hold nothing but fear and loathing? Or will she embrace the Natural life like her parents, like her brother, and try, someway, to live as human?